The use of attribution links is recommended by the engines themselves, although they caution publishers that the links are used as a signal but do not guarantee that the original versions will be given prominence for related search queries. In looking at syndicated content on Yahoo News most of the syndicated articles do not include attribution links (each news source likely has to request or provide them), but among those that do exist there is a problem. The Yahoo attribution links do not point directly to the original article URLs. Instead they point to an internal Yahoo News URL which then has a temporary 302 redirect to the original article. That URL then has a 302 redirect to the original LiveScience.com URL. Yahoo is probably using the temporary redirects for tracking but this practice is interfering with the SEO value of the links. So if you are negotiating a syndication agreement with Yahoo News be sure to request attribution links directly to your original URLs, or at least require Yahoo to use permanent 301 redirects. 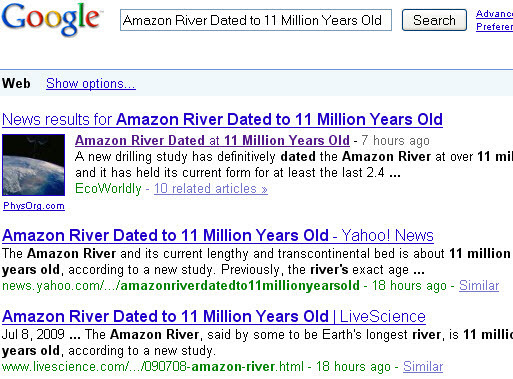 Another site becomes the de facto #1 through an embedded Google News result, followed by the Yahoo News syndicated article and then the LiveScience.com original. The good news for LiveScience.com is that Google is showing both results instead of filtering out their page in favor of the Yahoo version on a stronger domain. However the split result is certainly costing them clicks. Is this a growing trend with other websites that have a syndicated deal with other news sites to use a 302 redirect back to the articles original url? Asim, I don’t think there is a growing trend toward using 302 redirects, but there is a lot of variance in how attribution links are (or are not) implemented. Sometimes there is no link at all, sometimes there is a link to a URL on the partner site with a 301 or 302 redirect, sometimes the link points directly to the original URL. The various methods are often related more to technical setup or tracking than any kind of SEO tactic by the syndication partners. So it is important to have a requirement for direct links to your original URLs put into the syndication contract.